Checks multiple Apple stores for iPhone 5S stock with Simple tool. For those still on the hunt for an iPhone 5S and planning to buy it from an Apple retail store, there’s a new, unofficial tool that makes it very simple to search multiple stores at once. iPhone-Check, made by developer Mordy Tikotzky, just has you plug in your ZIP code, then pick what color and carrier you want. 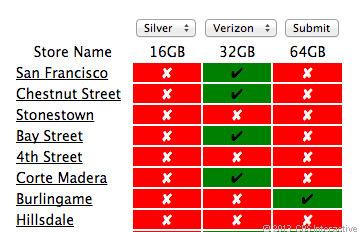 It then shows what phones are available at varying capacities at all of Apple’s stores in that area. The tool is US-only for now. It’s also unclear how up to date it is with Apple’s own store data. Tikotzky notes that the tool is actually scraping Apple’s retail store site to show availability. Apple brought back its stock-checking tool and in-store pick up option this week after offering it briefly last week. The option lets buyers reserve a phone for pickup without having to wait in line, something that’s become more important for would-be iPhone buyers given Apple’s currently nebulous shipping estimation of “October” on all 5S models.